Through participating in a wide range of activities in lesson time, pupils are also encouraged to take part in extra-curricular activities to further enhance their skills. Students also begin to learn the importance of effective coaching and evaluative skills and use these new learned skills to improve their own and others performance. PE in year 7 focuses upon developing a love of sport and physical activity. In year 8, students refine their fundamental skills and develop more complex skills in the sports already learned in year 7 as well as trying a new sport (lacrosse). By developing the more complex game skills it allows students to engage in competitive sports and activities at a good level. As well as developing a broad range of physical skills, students also begin to gain a greater understanding of the theory behind sports. Students become competent in naming the major muscles of the body and also understand the effects exercise has on the body. Extra-curricular activities play an important role in PE at Riverside. We have girls and boys teams across all year groups in the following sports: football, basketball, netball, handball, dodgeball, dance, table tennis, rounders, cricket and athletics. 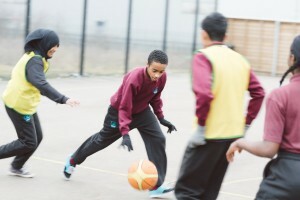 Riverside compete in regular fixtures against other schools, both in the borough and in East London. From year 7, pupils are divided into 4 teams; Dunlin, Wheatear, Sandpiper and Skylarks. Throughout the year they compete in these teams across a variety of different activities to earn points for their house. Inter-house competitions include: football, table tennis, basketball, handball, rounders, dodgeball and athletics. The culmination of inter-house is the school sports day at the end of the year where the pupils get the opportunity to compete at a venue which was used in preparation for the London 2012 Olympics.